Mechanisms of exclusion and separation are an inherent part of our life. Themes, materials and substances that go against our ideals of closeness, normality and beauty get degraded as alien and dangerous – a normalized behavior that derives from social norms, taboos and necessities. Senses of shame or disgust are no natural occurrences. Their defiance is considered as the violation of a system’s rules and standards. Even though the exhibition of the artists Duke and Battersby at gallerywest is titled “Pain Shall Be No More” several social norms get wounded as it contains various aspects of life, that are usually dismissed and denied – failure, fear and weakness, violation, disease, addiction and death run like a thread through texts, drawings, photographs, objects and a short film. 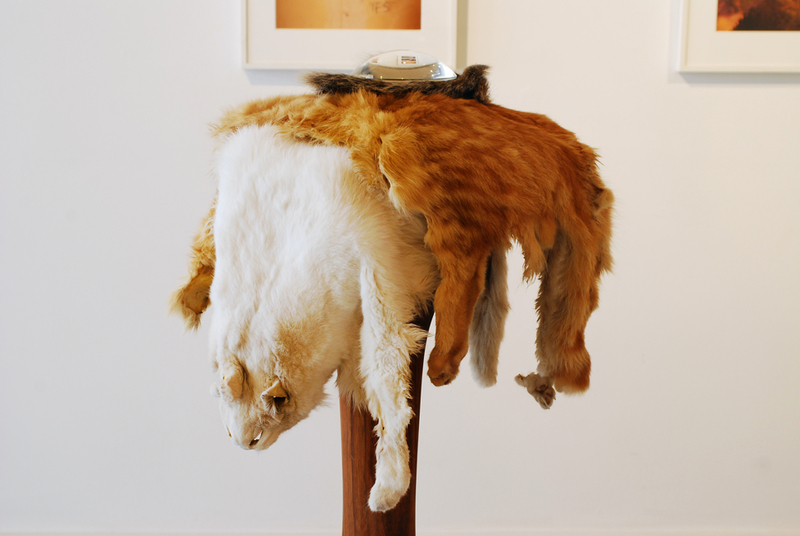 An arrangement of two skinned cats, animal teeth and a beetle carapace on a wooden plinth forms the center of the exhibition. These relicts of former life can be seen as dunning reminders of life’s fugacity and fragility, resembling old vanitas-symbols but also as an ode to the curiosity of life, its fascination and weirdness, its wonder and beauty. 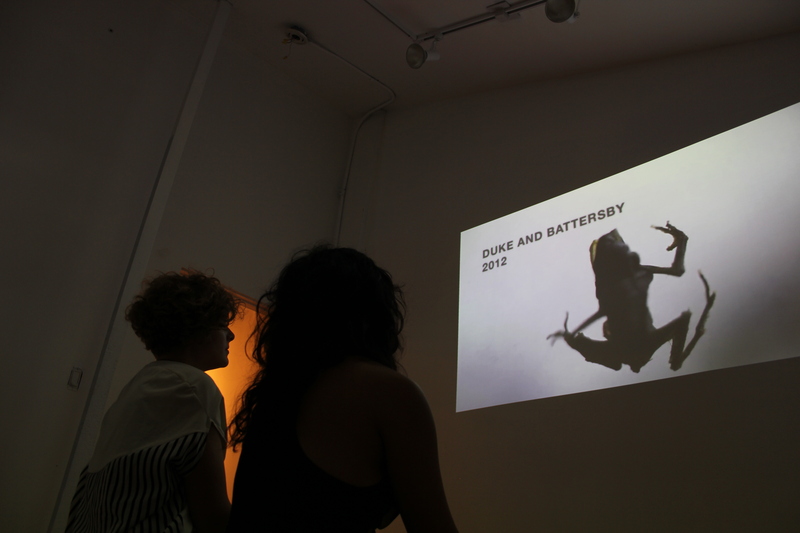 The work of Duke and Battersby is ambiguous. Pain, loss and ugliness are opposed to hope, beauty and humor. The blending of dark radicalness and harsh humor with poetic tenderness lies at the core of their artistic language, where frangible bones are used to build the title “The beauty is relentless”, where fine stitches form the words “Daddy you fucked up again” or where two young boys chat about a girl that is said to “swallow” captivating the spectator through its unabashed directness and soulful energy. The spectator finds himself in a climate that is both frangible and strong – a powerful undertow that visitors responded very differently to: spontaneous laughter, fervent enchantment, honest emotion and serious anger at all the pain in an exhibition with a title that seems to promise the contrary can be heard, felt and seen at gallerywest these days. 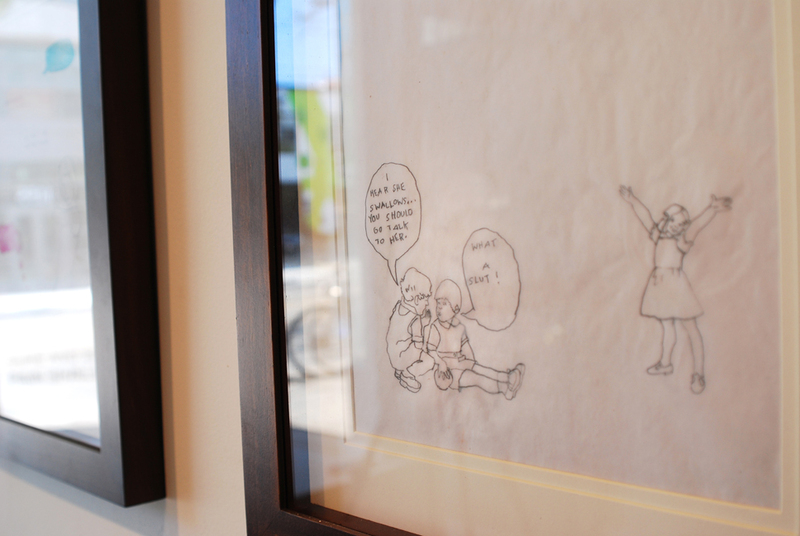 The couple’s work is far away from asking for laborious decryptions. It rather aims not only at our mind but at our feelings, the most existential ones – love, loneliness, joy, sadness and most important – empathy. Although the work is intriguingly personal, it contains a universal power: The spectator is not only confronted with the artist’s feelings, he actually feels himself – in the sense of becoming aware of the own pain and liveliness but also in the sense of feeling for other people. This key set of the video “Here is everything”, a complex work of stunning images and important theses, which is considered as the trailer for a longer future version, describes a human ability that is both essential and neglected in our times. Mostly tending to go through the world in a focused and self-centered way we lose sight of our capacity to love other people, even strangers. In a haunting way the couple pursues thoughts about fellow feeling as a means of ethical action, its groundbreaking power and the possible consequences in the case of its loss. To take creative potential from failure, incapacity, sorrow and frustration instead of excluding those seemingly abject aspects of life both constitutes and relieves pain. With this approach the artists succeed in creating repellent and moving, tender and hard images and thus reach to the core of what it feels to be human. gallerywest named “Best Gallery” by readers of The Villager!